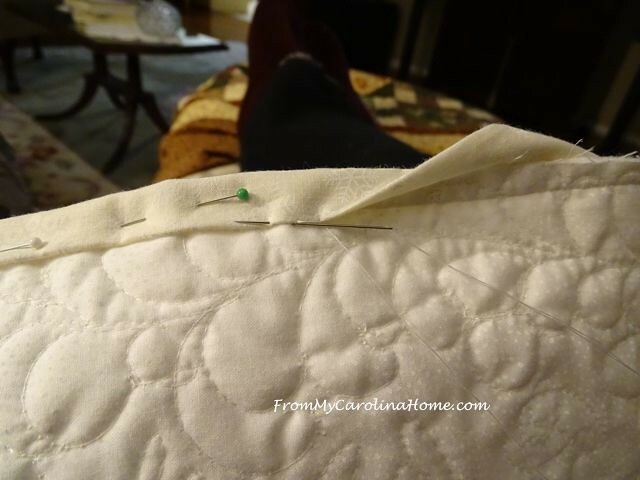 One thing I need to practice much more is free hand quilting. 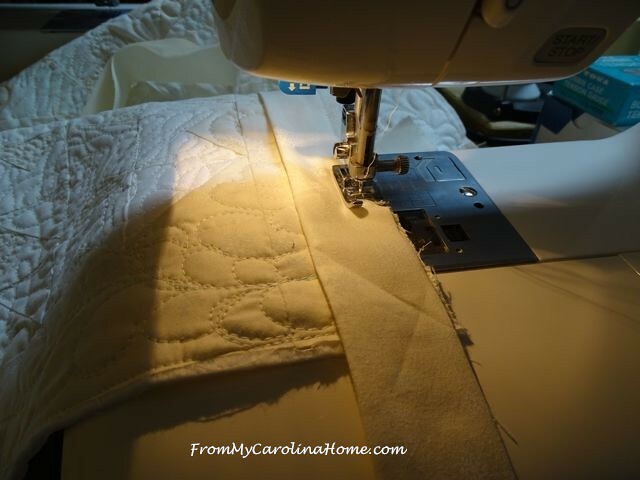 I can do feathers most of the time, and some ribbon candy but I am often stymied by the lack of ideas for quilting without a pattern or pantograph. 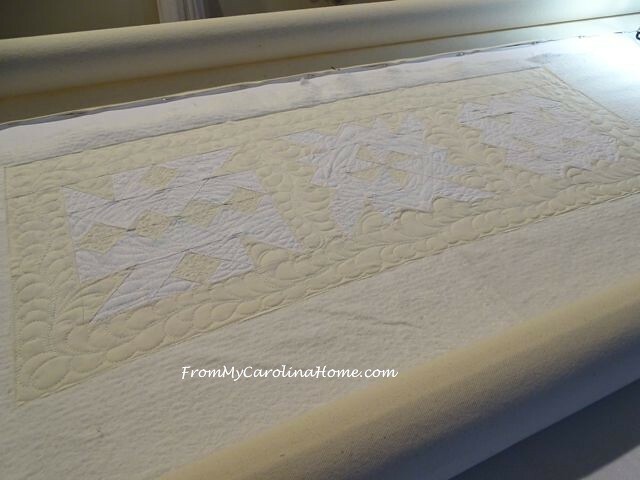 Small projects do lend themselves to experimentation, so I decided to custom free hand this runner. I wanted the background ecru to be different from the white snowflake blocks. 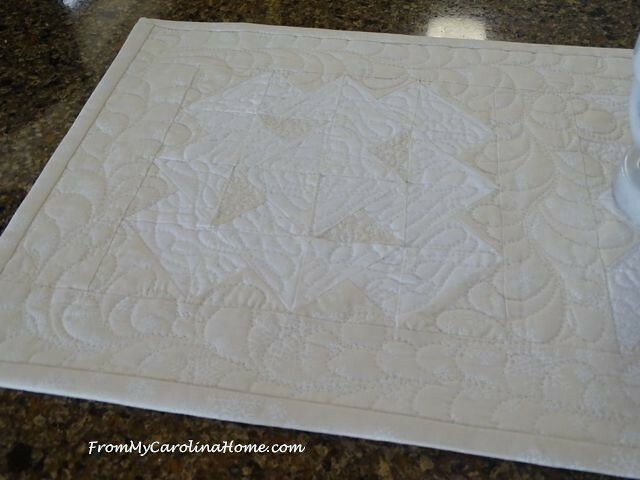 As this runner is very low volume, almost no contrast to differentiate the white from the ecru, I hoped the quilting would help. First, to decide whether to use ecru or white batting. 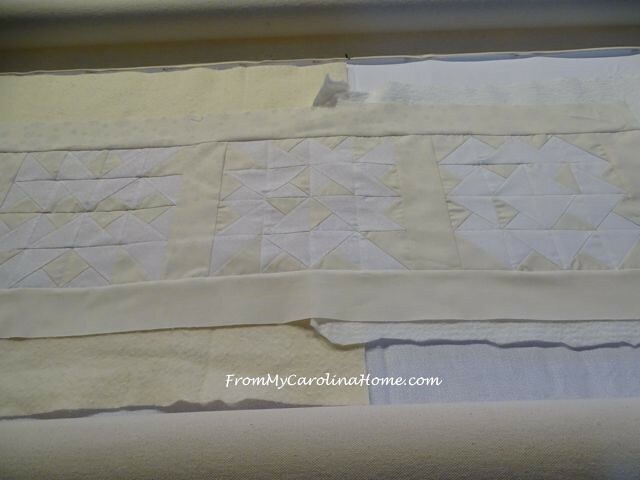 The white brightened the white areas a bit more, so I loaded it on the longarm and stitched down the edges. 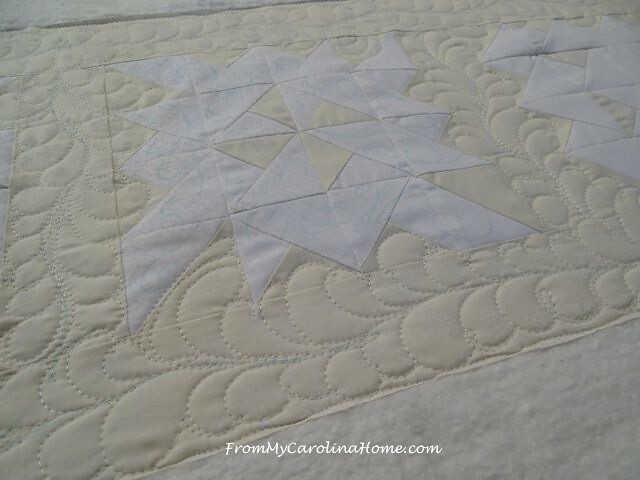 I put feathers around the border, working them into the areas in ecru around the snowflake blocks. Oops, missed one. Now the really scary part, marking the white areas with a water soluable blue pen. Yikes!! Then I didn’t like what I drew, and drew more lines over those. I wanted to practice some pebbling in the ecru triangles, so I did that first. In the end, I ignored the markings and did some loops. 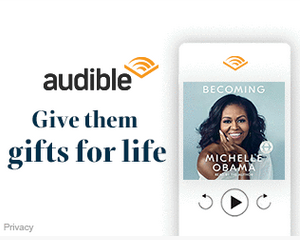 Bad choice, it does nothing for the snowflake idea, but I am not frogging it. Kinda, meh on the quilting. Feathers are OK, but the rest is really mundane. They don’t look much like snowflakes, but I do like the white on ecru. I probably should look into a few stencils. The binding was a bit longer than two strips, so I put a short strip between the longer ones. 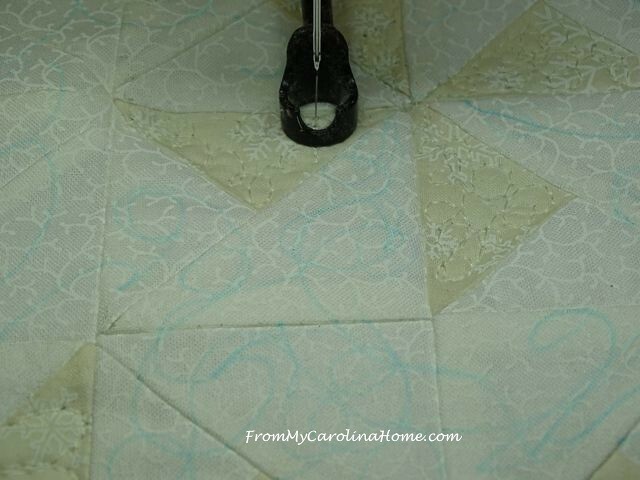 I laid it out to be sure that the seams didn’t end up on a corner. Stitching it down in the usual way. Slow Sunday Stitching while watching the football games! Finished, and displayed on the kitchen counter. Here are a couple of close up shots, after it was ironed and the blue marks removed. Whew, yes they all came out. 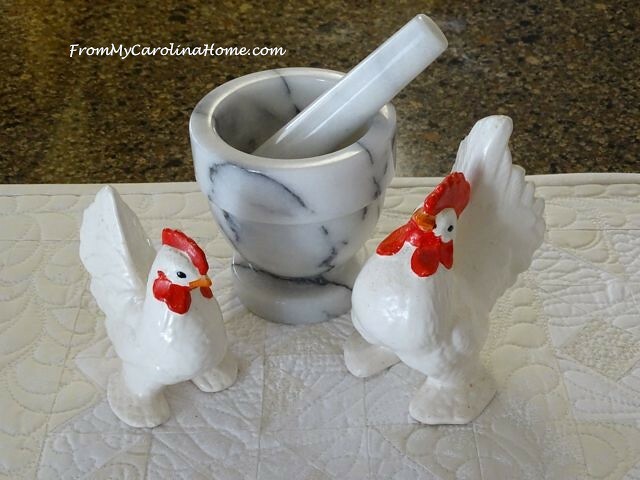 I liked the mortar and pestle on it, with my grandmother’s little white chickens. I like to burn a candle on the counter too, the Butter Cookie one goes well. I think I am done with white for now. I’ll enjoy the clean feel of white through January, then it will be on to Mardi Gras. 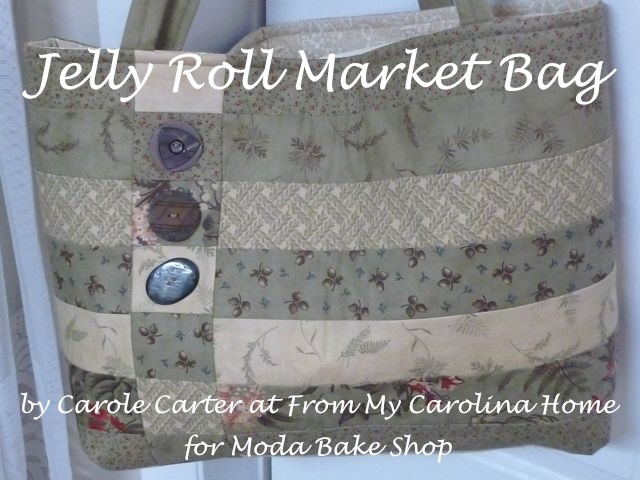 Oh, Carole…..that is simply LOVELY!!!!!! (as usual) Your work is so special! 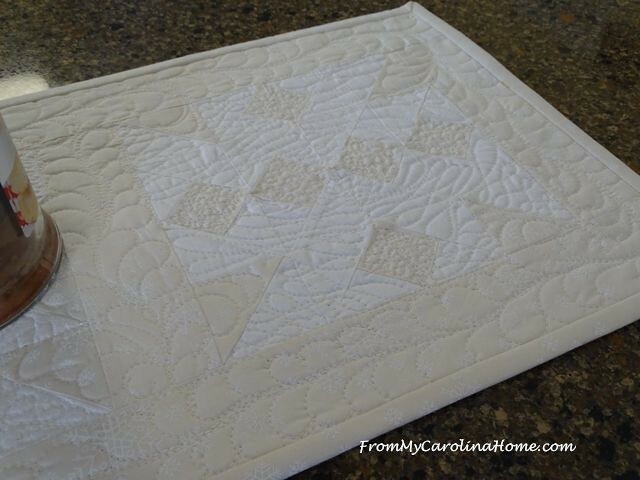 I like how you were able to add definition between the two colors through the quilting. Lovely stitching. The soft neutrals are gorgeous. Yeah, I like it. It does sort of add to the snowy winter feel. It looks great on your countertop too — with the chickens, adorable. 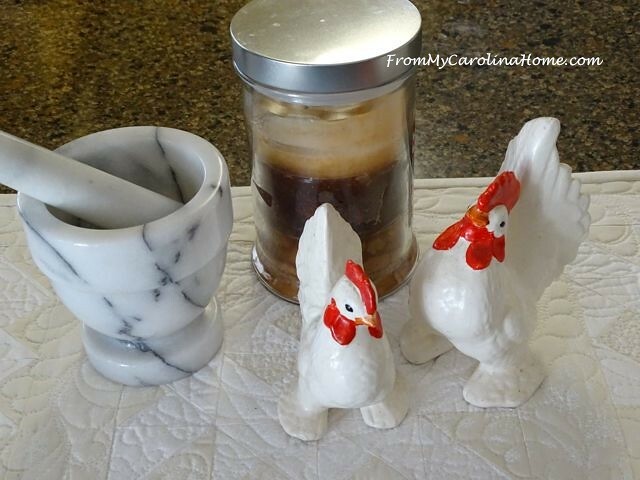 Your work is lovely and you have created an adorable countertop display, Grandmother’s collectibles are the best! Love this, you are so talented.. 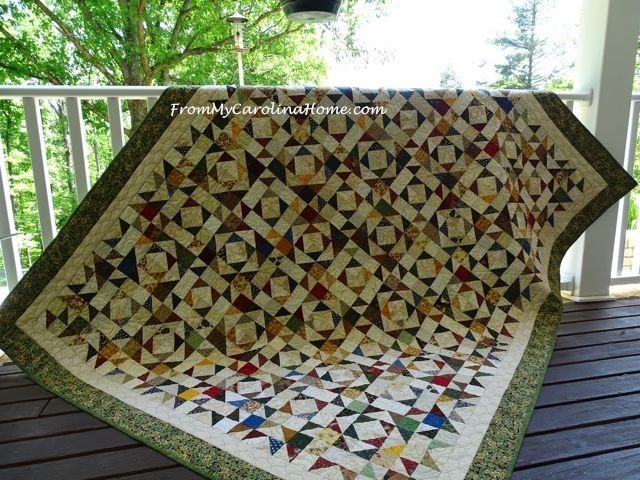 The runner is just beautiful…..I plan on making one too…I’ve picked out my fabrics but haven’t started it. 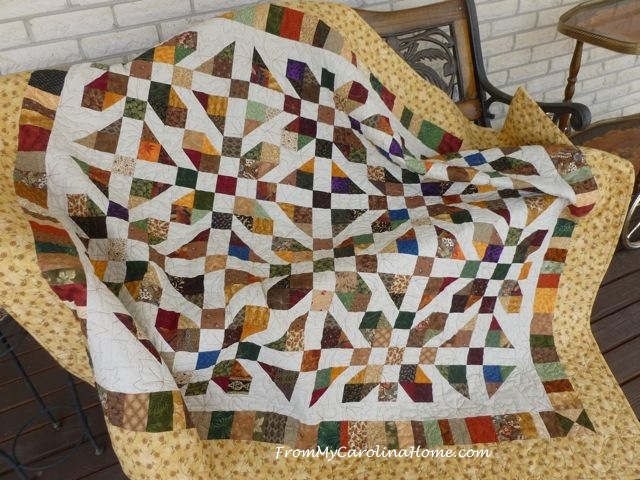 I love the pebbling and the feathers….I’ve not decided what to quilt in the white sections….although I do like your loops…perhaps as more ribbon candy-ish. Thank you for sharing and inviting us to quilt-along with you. 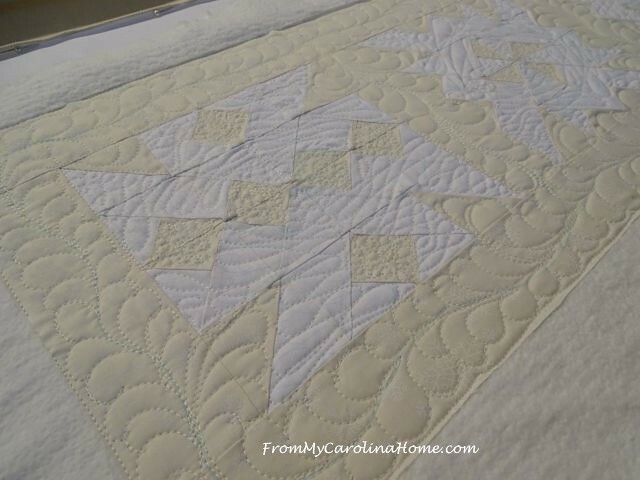 Your work is gorgeous, and the combination of white/ecru is stunning, so elegant! 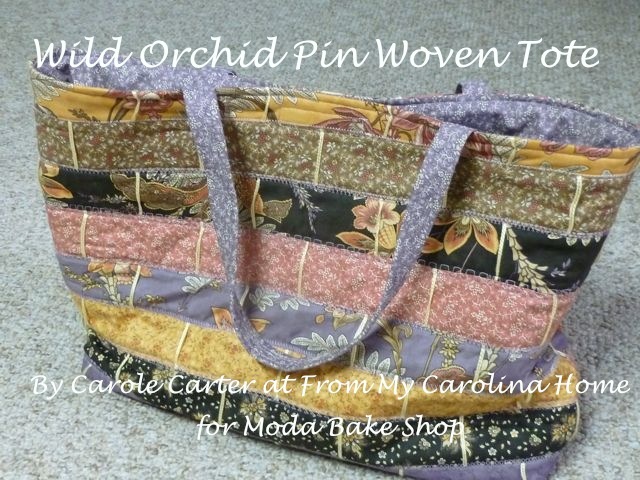 Good Morning Carole! Thank you for sharing this whole project with us! Again, I would never have thought to use the Ecru and white together, but now I will. While you were taking pictures on the long arm, it amazed me at how clearly the two color values showed up very distinctly. Your feathers are superb, feathers are so breathtaking beautiful…well until we get to mine LOL. 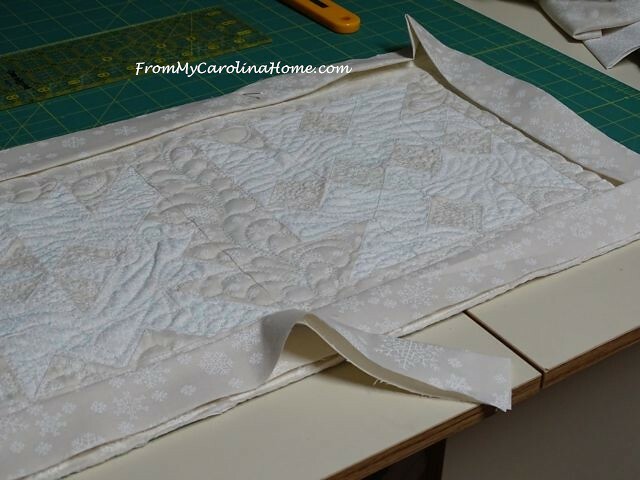 The other patterns you used for quilting are very nice choices also and look great with this table runner. Like so many others comments, your Grandmothers chickens just work perfectly sitting on the table runner! I can smell the aroma of the candle and am oooohing….hee, hee, hee! Like Rosemaryflower, though, in the kitchen environment I would be petrified of splattering spaghetti sauce and blackberries all over it from 5 feet away! Oh Yes, I could…it is amazing how these kinds of accidents happen when I am around. LOL. 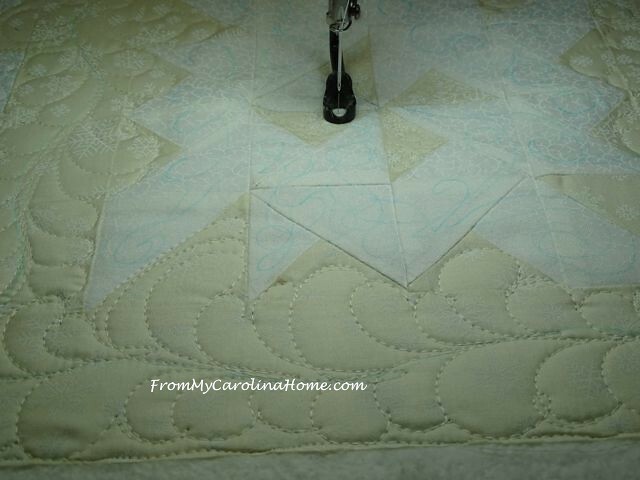 Today I am going to cut out some of the black half square triangles for the Mystery Quilt Along. The 3 of us decided to go with the black background. 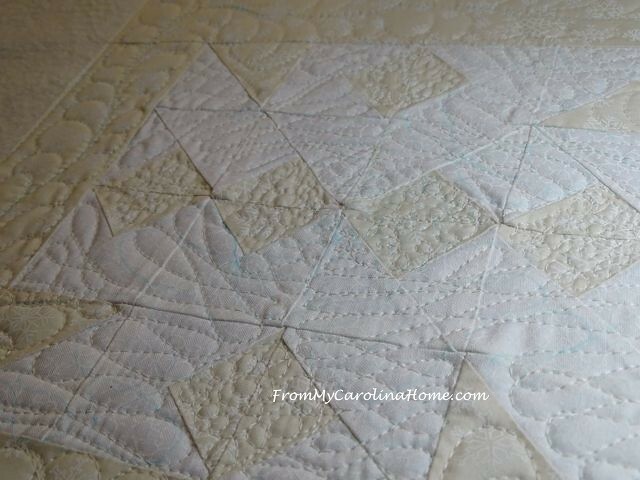 I am really excited to see how this quilt is going to turn out! I will try and post some pictures later on today also! Yippee….Lets get this party started Ladies! Have a fantastic creative day Carole! Love the colour play between the white and ecru. Beautiful table runner. It really turned out nicely ♥ and I love the little white chickens ! Really beautiful, great,contrast with minimal value shift. 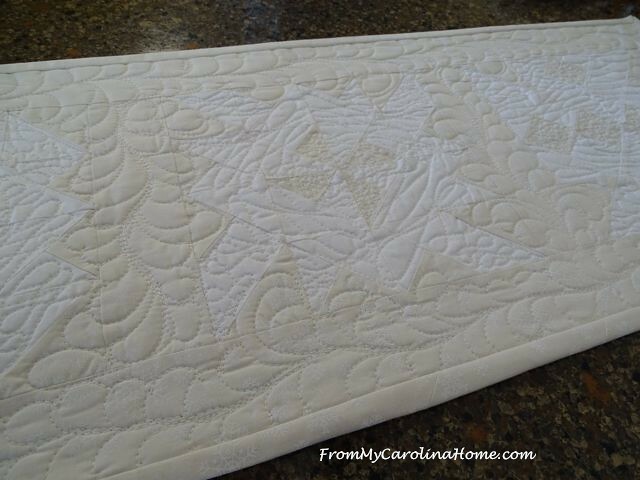 I love your quilting approach, but it is way more than I can attack on my domestic machine! 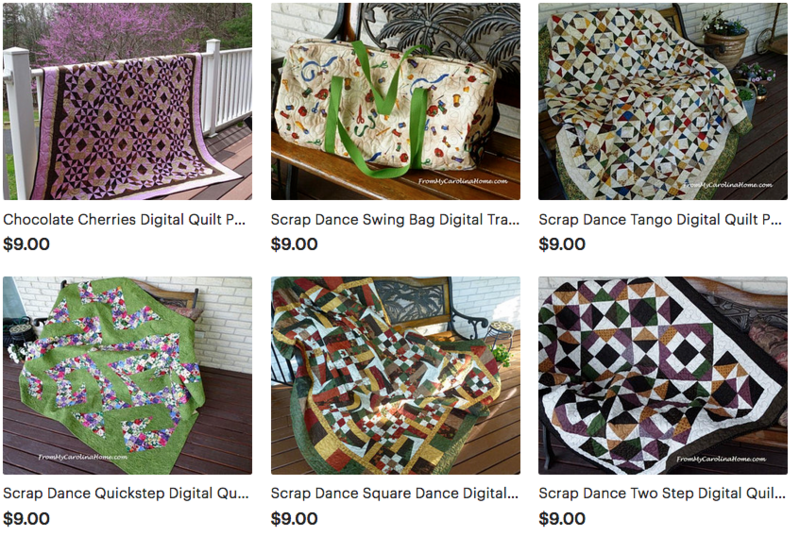 Thanks for sharing that process, I’m always looking for new thoughts and ideas about the quilting process. I can’t wait to see what you do for Mardi Gras! This is beautiful! I love the subtle contrast in this piece! I really like the feathers that you quilted. 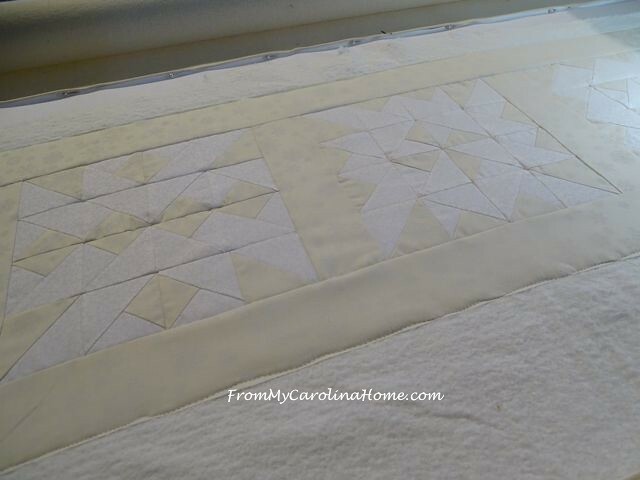 Even though you are not thrilled with the other quilting at least it allowed you to practice. I think the final result is quite pretty. I love the feathering part a lot. 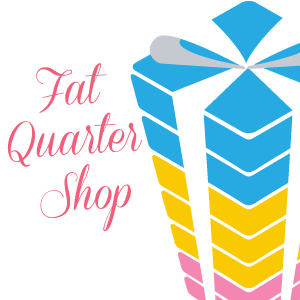 Looking forward to seeing your Mardi Gras decorating! 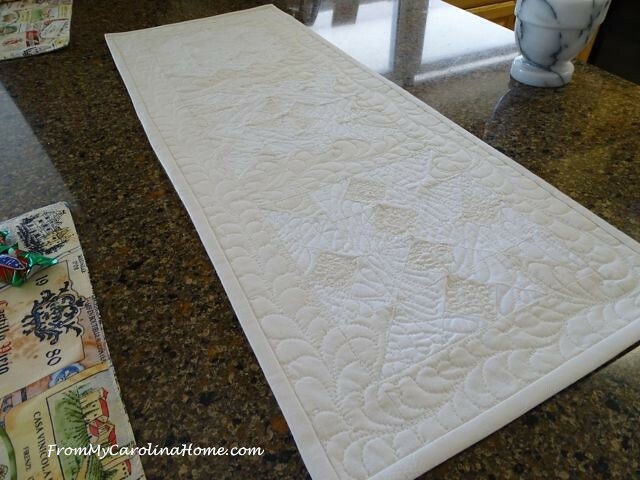 Beautiful table runner, love the quilting. Just got a chance to really look at it, love the concept and execution! Gorgeous feathers on the ecru. 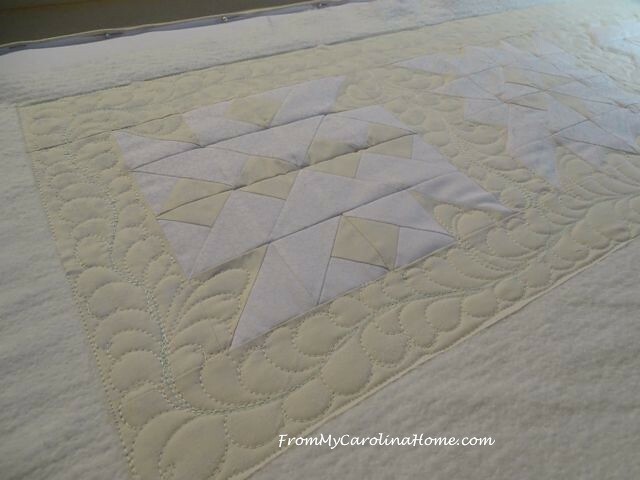 You’re right about the white parts: maybe echo quilting inside the points would have done what you wanted, emphasize the geometry of the snowflakes? I don’t machine quilt at all yet other than walking foot so can’t criticize! I do love snowflakes, and yours turned out great! No matter your first intention, I like how crisp and pure it looks.